Ymunwch â ni am sgwrs, paned a chyfle i ymarfer eich Cymraeg. Mae croeso i ddysgwyr a phobl sy’n rhugl. Join us for a chat, a cuppa and an opportunity to practice your Welsh. Learners and those who are fluent in Welsh are all welcome. Relax, have fun. A chance to be creative. 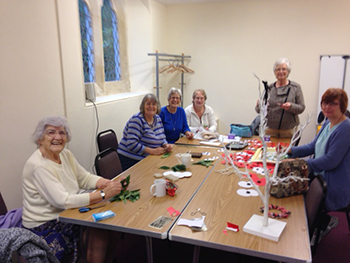 Crafts and skills to try out OR just chat, have a cuppa and make friends. 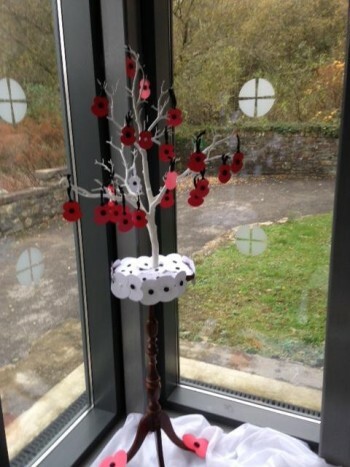 For Remembrance Sunday, 7 November 2015, the group created impressive displays with poppies of various sizes which were handmade including the centres which were moulded out of clay and then painted. 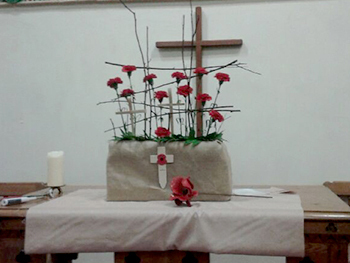 The photographs show the members of the group and the Remembrance Day displays.